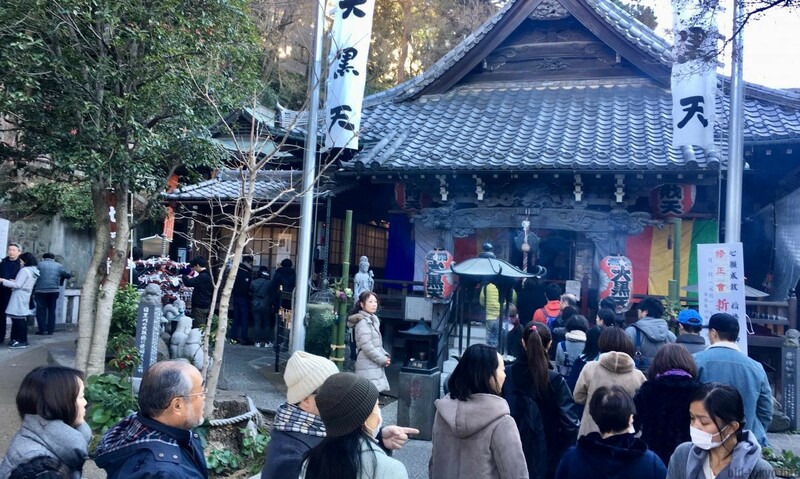 In the first days of the year many Japanese visit shrines/temples in order to pray to each of the so-called “seven lucky gods”. It is my third time that I am doing a trail to visit each of them, you can read up on my 7 lucky god pilgrimages in Ningyōchō and Mukōjima (along the Sumidagawa river). This course is not in shitamachi as the two other trails that I did, but in the originally more rich yamanote area of Tokyo. This course in and around Meguro is said to be the oldest around, dating back from at least the end of the 18th century. It is not to be confused with the (less old) Yamanote 7 lucky gods trail in Shinjuku. This Shichifukujin Meguri (七福神めぐり, 7 lucky god course) takes you to 6 temples (for the seven different gods, one temple has 2 gods, these are a hodgepodge of gods with their origin in Japan, China and India), where you can pray for luck in the new year. Interesting fact is that all of these gods are “hosted” at temples at this yamanote course, not at shrines as is the case in Ningyōchō. I collected the stamps that are available at each place to commemorate the visit. I bought a special board (called shikishi, 色紙) on which to put the stamps at Kakurinji Temple for JPY 500. See the resulting board at the top of this page. The procedure to collect the stamps was different than in Mukōjima. You do not have to go look for the place where you can put the stamp yourself, but rather go to the reception desk (where they sell the o-mamori) to ask for the stamp. Then they will put the stamp for you, together with a signature. It is important that you put your name on the back of the shikishi, as they will call your name when they are finished putting on the stamp and signature. Another important detail is that they will charge JPY 300 for each stamp. 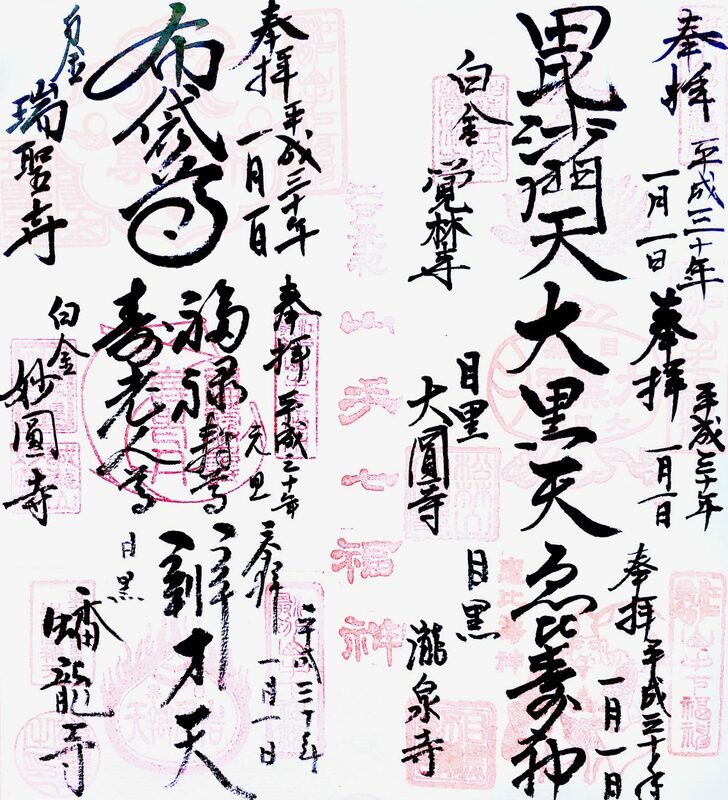 The reason for this is that they are not just putting a stamp, they will also write in beautiful calligraphy over the stamp as you can see at the top image. On top of this, you can buy a small figurine (called daruma) of the lucky god for JPY 500 each. All prices listed are for early 2018. Keep in mind that the lucky god is often not worshiped in the main temple building, but usually in a separate structure. You can find a map with the 6 temples I visited at the bottom of this article. Start at Kakurinji Temple, a 6 minutes walk from exit 1 of Shirokane-Takanawa Station (Mita Line, Namboku Line) or 8 minutes walk from exit 2 of Shirokanedai Station (Mita Line, Namboku Line). Walking along the temples with a short visit takes about 2 hours, depending on how long you stop by each place. Collecting the stamps is only possible between 1 and 7 January (or next Sunday) between 9:00 and 17:00 and will take some time. It is safe to allocate at least 3 hours in order to do the full tour. 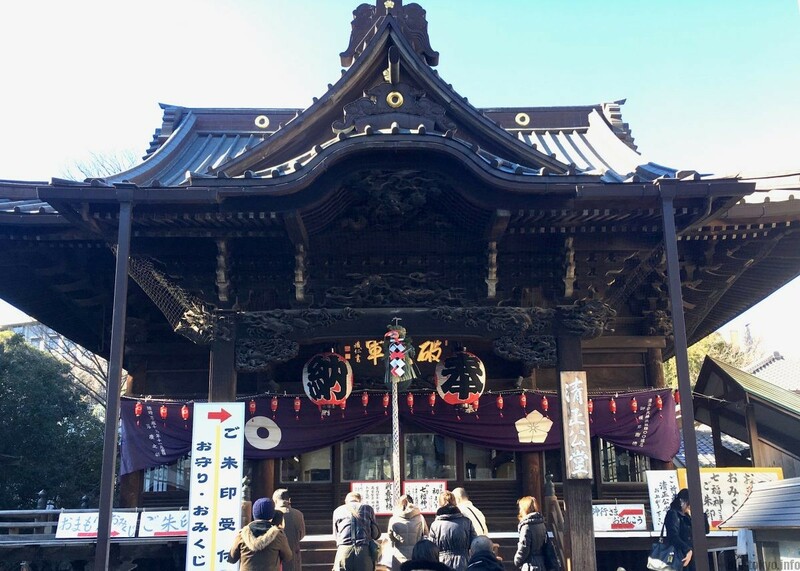 This course takes you to 6 temples, at Myōenji Temple 2 lucky gods are worshiped. The walking distance between each location is between 8 and 10 minutes. Temple of the Nichiren sect of Buddhism founded in 1631. The main temple building (the Seishōkōdō, the temple is also known as Seishōkō) was built in 1865. The temple honours Katō Kiyomasa (1562-1611), one of three senior commanders during the Imjin War (1592–1598) against the Korea. He is known as a great warrior, but also has a dark side (read up on what he did to Christians). He was daimyō (feudal lord) for Kumamoto. Lucky god: Bishamon-ten is the lucky god that is worshipped here, the god of victory from which one can receive virtue. In particular revered by the warrior class, suitable for a temple that honours a great warrior. Temple of the Ōbaku sect of Zen Buddhism founded in 1670. The current huge temple building dates from the early 19th century and is designated as a national important cultural property. 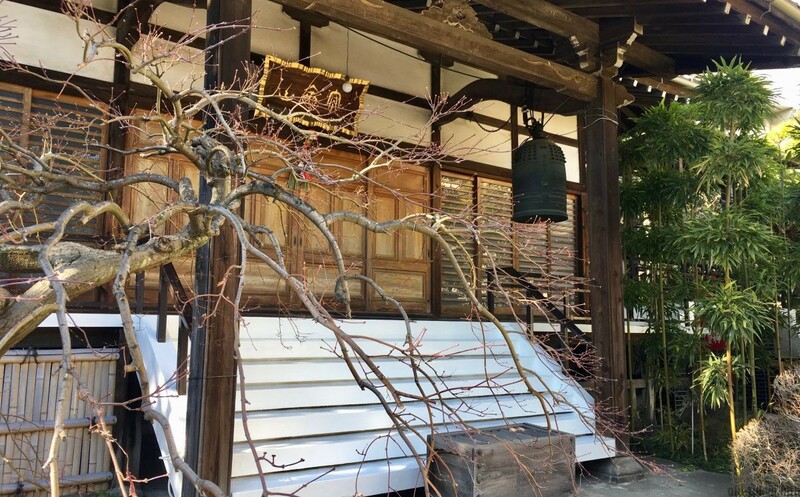 Ōbaku is one of several schools of Zen Buddhism (next to Rinzai and Sōtō), being a smaller school as compared to Rinzai and Soto, many characteristics can be seen here that can not be seen at other temples in Japan, such as the peach carving at the front. The main temple building of Zuishōji. Lucky god: Hotei, a Chinese Zen priest, is worshipped here as a god of fortune and guardian of children. He is also called the god of popularity. Temple of the Nichiren sect of Buddhism founded in 1620. The original buildings were destroyed during the Tokyo bombings in 1945. The current temple buildings dates from 1954. It was the only temple on the course where I had to go inside (without shoes) in a side building, where 3 monks seated at a low table put the stamp on the shikishi and made the calligraphy in front of me. Lucky god 1: Juro-jin is the lucky god at this shrine. You need to get in touch with him if you want virtue and longevity. Lucky god 2: Fukurokuju is worshipped here for virtue and longevity. Temple of the Tendai sect of Buddhism founded in the early 17th century. 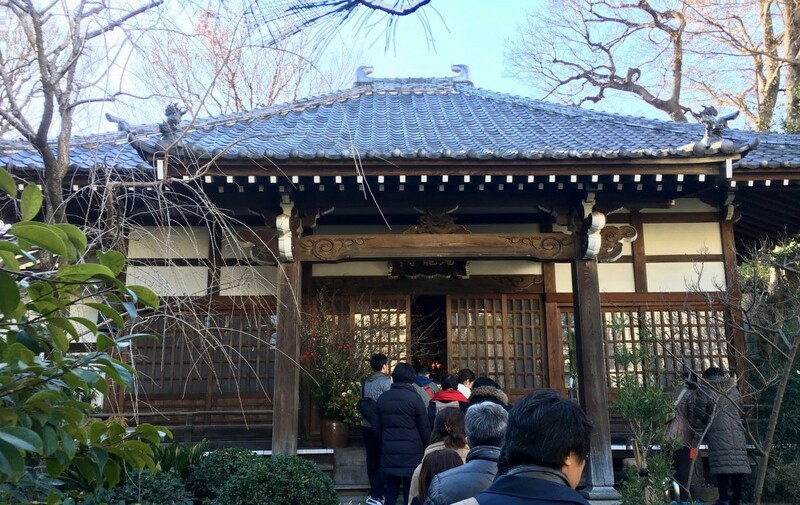 Daienji is much more crowded than the first 3 temples on the course. There is much more to see as well. 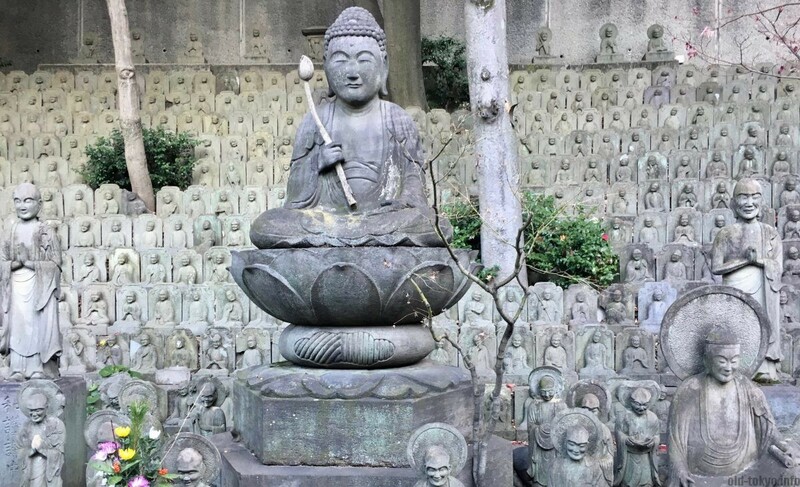 In particular the Buddha figure on the left stands out with in the background 520 small statues (mainly arhats). These were erected in memory of the victims of the fire of Gyoninzaka in 1772, one of the three major fires of Edo (the other two were in 1657 and 1806). It was speculated that the fire started at this temple. They also have a nice collection of statues for all the 7 lucky gods. A good photo opportunity, but in my case there were just way too many people to take a good shot. Lucky god: Daikoku-shin is the god of five cereals and wealth. Temple of the Pure Land sect of Buddhism founded in 1648. Not much to say about this small temple except that it has a cool name, freely translated it means “temple of the sheltered dragon”. The procedure to get the stamp and signature was a little bit different in comparison to the other places. After I gave the shikishi at the reception and asked for the stamp, I was requested to go and pray first and then pick it up on my return. Lucky god: Benzai-ten, the goddess of music and charm, is worshipped here. Benzai-ten (often referred to as Benten) is the only female presence among the 7 lucky gods. She is also a provider of learning and wealth. This is the biggest temple on the trail, and oldest. 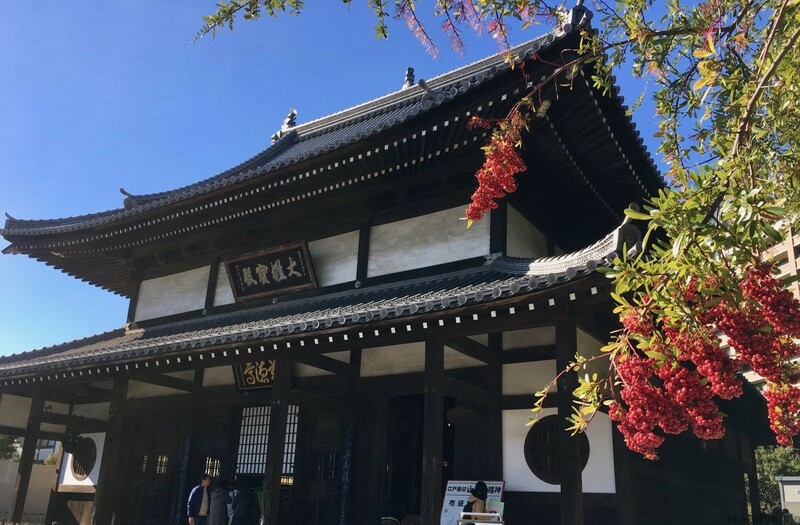 Ryusenji is a Tendai sect Buddhist temple founded in 808. It is mainly known as Meguro Fudōson, which translates as “Black-eyed Fudō” due to the black-eyed statue of Meguro Fudō-myōō. The name of this district (Meguro) is derived from this statue. The temple building is very new, from 1981. The place for receiving the stamp is a bit difficult to find. If you enter the temple from the main gate it is in the sub-temple on the right hand side (if you come from Banryūji temple you will likely enter through the back of the temple, which means you need to go downstairs away from the main temple building, and then go to the left). There is a sign (御朱印) in Japanese to guide you to the place. While for most of the temples on this yamanote course the 7 lucky gods were a major activity, it seems that for this one it was rather a small side business. Lucky god: Ebisu-gami, one of the most popular gods, is the god of prosperity and wealth in business, and of abundance in crops, cereals and food in general. In his right hand he holds a fishing rod, in his left hand a fish (often a tai fish), as he is also the patron of fishermen. Out of the 7 lucky gods, he is the only one with a pure Japanese background without any Hindu or Chinese influence. Note: I have added “temple” to the temple name in Japanese for clarity. The “-ji” suffix in Japanese means “temple”. On the map below 3 other sights in the area are also marked that are worth a visit.